Q&A: Such a Thing as a "Fake Rug"? I am am at the very start of looking for rugs and wanted to know if there is something or such a thing as a fake rug? Hello and thanks for writing in! This is an interesting thought and certainly a somewhat of a broad topic. While many of those in the Rug Industry would say there is such a thing as a "fake rugs," you may not be able to get the same answer from each. We'll show some examples we would consider "fake" at the end of this response, and some "authentic" rugs too. We also look forward to hearing what others in the industry have to say about this topic too, so check in with the comment field at the bottom of this entry! Our position is the following: An "Authentic" rug to us would be one which is entirely made by hand, excluding "hand tufted" rugs. Without getting into detail on construction techniques of rugs and carpets, here are some Rugs we consider "real": Hand made soumac, hand knotted rugs/carpet, hand made needlepoint, "american" hand hooked, hand made dhurrie, hand made kilim, etc... "Fake Rugs" would be as follows: Hand tufted, machine anything...etc. 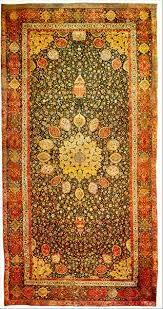 Some in the business would go so far as saying a hand knotted Indian made Persian design Rug is a "Fake". However, our position is that rugs are a very eclectic art. Many interpretations and adaptations have been incorporated into rugs for hundreds of years. Just because a weaver "replicates" a design seen in a "Museum Piece" such as one of the famous Ardebil Carpets (seen right and left: Ardebil from the V&A Museum) does not qualify it as a "fake" in our book. In these instances, we would venture to say: If it's hand knotted, it's authentic. Even if it's a reproduction or "interpretation" of such. Whether it's from India, Iran, pakistan, China or other. Perhaps the only "Faking" is if the seller tries to pass such rugs off as being the original, or uses other deceptive tactics to sell the rug. In these instances, a rug may be considered a "fake" by some. Here's how to tell the difference between hand knotted, machine made and hand tufted carpets. It's worthwhile dropping by the Rug Rag Forum for confirmation on pieces under consideration. Sure it's an "Oriental Rug" "inspired" design, but it's hand tufted. In our book, a fake, even if it is from Pottery Barn. It's a Sisal Rug. Sure it's an "Authentic Sisal" Rug, but after all is said and done, this one's not "hand made." In other words, it's not quite "authentic" to us. There is such a thing as "faux" rugs which are actually painted on the floor. I've seen this in Summer beach homes. Folksy, fun and certainly "fake." That's some mouth on the animal "rug." Thanks for the novel thoughts. 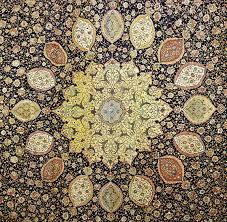 I am looking into buying a oushak rug. I have found two rug stores willing to take my trade-in(an Indian Japoir I bought about three years ago in excellent condition)The oushaks on ebay are considerably less than what I saw today in their stores. They are willing to take my rug for about 2500(I paid 3300) plus pay another 3-5000 for a few of the rugs I liked today. Is it worth it to trade-in and negotiate a rug for 1500 (for a 9x12)or should I consider keepng my rug and purchasing a rug on ebay for around 1500-1800?